Author: Rakoff, Alvin Set In . . .
Leonard Abelson is one of seven children. He lives above Abelson's Hardware on Baldwin Street in Kensington Market in Toronto. It's the 1930s. Leonard's father, Sam, a former merchant sailor who speaks fourteen languages, does the purchasing for the store; his mother, Pearl, a Ukranian ?migr? who was a victim of pogroms and marauding Cossacks after WWI, runs the shop floor. Leonard wants to be a writer. He witnesses the affections, struggles, and meager hopes of his neighbors?fuel for his imagination. Periodically, Leonard has to look after a young philosophy professor from the University of Toronto, Menasha Rifkin, who suffers from fugue states, squatting among the stalls on Baldwin Street reading Spinoza, Kant, and the Globe & Mail. Halloween 1936. A band of young Italians invades Baldwin Street in search of blood. Marshall McDonald, the Irish cop who failed to quell the famous ?Wop? vs. ?Yid? riot at Christie Pits six years earlier, now must investigate the death of Bernie Altman, a young boy whose senseless slaughter lingers over the Jewish community like a bad dream. 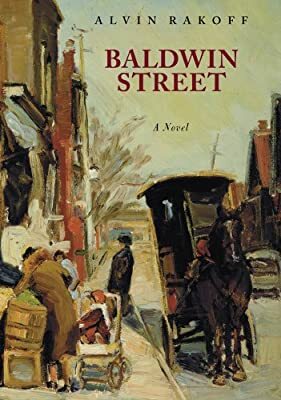 In the tradition of James T. Farrell's Studs Lonigan and Nelson Algren's Man with the Golden Arm, Alvin Rakoff's Baldwin Street is literary fiction at its best. This powerful novel presents a vivid mosaic of characters, the rich fabric of a community, and a boy's coming-of-age on the dusty, rough-and-tumble streets of Toronto.